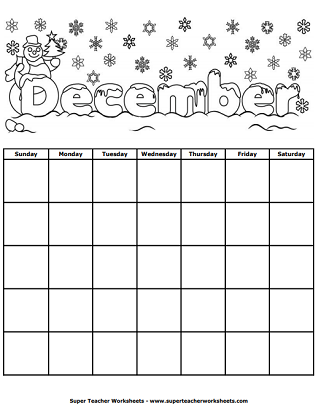 Print out a blank calendar each month for your students to color. Plenty of space in the squares to fill in dates, holidays, and birthdays. This January calendar has an ice hockey theme! Color the January calendar, add the numbers, and fill in the important dates. Picture of snowman and snowflakes. Color the February calendar. Then, add the dates, and fill in the birthdays and holidays. Picture features hearts and Valentine theme. 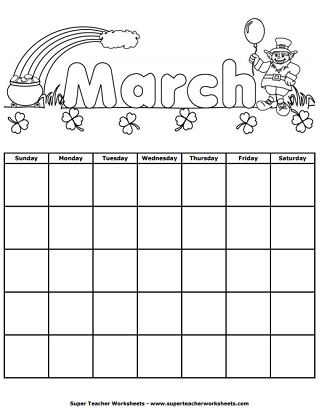 A March calendar to color. Just write in the numbers, and fill in the important dates. Picture of a leprechaun with shamrocks. An April calendar to color. Then, add the dates, and write in the holidays. Picture features flowers, umbrellas and raindrops. A May calendar to design and color. Picture features a flower garden theme. Color the header on this June calendar, and add the dates. Header has a baseball theme. Color the header on this July calendar, and add the dates. Header has a picture of a beach chair, sand castle, and ball. Color and print this July calendar. Picture features a star theme. 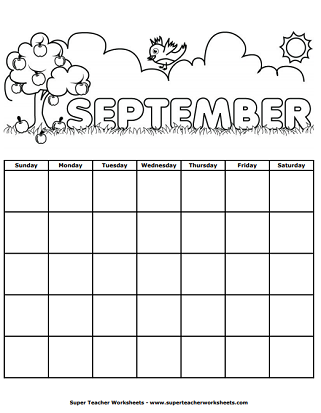 Color the header on this August calendar, and write the dates. Header has a picnic-themed graphic. An October calendar to print, design, color. Features a spooky spider theme. This December calendar has a winter theme with pictures of a snowman and snowflakes. 30 Days has September printable months poem, plus a worksheet. Print these word on card stock. Use them for your classroom calendar, on a word wall, or in a pocket chart. These pocket chart-sized cards have the months of the year on them. They can be used as calendar toppers or on a classroom word wall. Learn to use a calendar with these printable calendar math worksheets. Create your own monthly calendars with STW's calendar generator. Choose the desired month and year. Then add your own special dates. Printable lesson plan books, student agenda books, gradebooks, and more.